We believe in giving value added & quality services to our clients & enable them to get more than satisfaction to their customers. At SAHILGRAPHICS we built our business by focusing on our strength, market-driven like new products, exclusive varieties with best qualities. Sahil Graphics has always focused to giving our customers best services & holding to our core value which always place our clients interest first. These values are reflected in our business principals, which emphasizes integrity commitment to excellence, innovation & teamwork client turned to â��Sahil Graphicsâ�� for itâ��s complete requirements for Fully Automatic Non woven bag making machine, Non woven carry bag printing machine, Mini Offset Printing machine, Sheet fed offset printing machines either single colour, two colour, three colour or four colour. Be it our products or services, they are all designed to enhance customer satisfaction. The Company's customer obsession is best demonstrated by its representative customer list covering some of the major Printers and Publishers in private and government sectors and their acknowledgement of our product and service quality. SAHIL GRAPHICS has also been engaged in trading of various types of non woven d cut bag making machines, non woven bag printing machine, Paper bag making machines, Napkin Making Machines etc, through sourcing or buying from both domestic and international market like China, Taiwan & Korea. Leveraging its experience in the field of technology, sourcing and marketing of Automatic Non woven d cut bag making and non woven carry bag printing machines has thus been able to provide its consumers, a wider variety and range of quality products. We continuously strive to meet with our customers, very high expectations and this is the main motivator behind all of what we do. We not only just meet with customer's expectations but surpass them too. 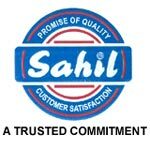 Our dedication and commitment to maintain very high quality standard has earned us over 2000 successful SAHIL Offset Machines installations every part of India. Behind this commitment we have a dedicated team of professionals that seamlessly integrate our well-proven systems and operational processes to deliver quality products, at a competitive price, on time. The success of SAHIL Team is based on the hard work of our engineers, manufacturing technicians, internationally trained service engineer, production and accounting professionals, all performing in harmony to serve our customers at every stage : from the sourcing of the best raw materials - to production - to dispatch to the end-user-to after-sale service and support. SAHIL GRAPHICS involved in market expansion beyond the shores of India to ultimately have a global footprint for its offset printing machines and other products. The Company is exporting to more than 16 countries including Malaysia, Mauritius, Philippines, Dubai, Saudi Arabia, Abu-Dhabi, Kuwait, Jeddah, Syria, Uganda, Nigeria, Liberia, Kenya, Bhutan & Nepal.etc. Taking advantage of its advanced and extensive global network, SAHIL GRAPHICS is now also exporting products sourced from other manufacturers in India and abroad. All our international clients have acknowledged us for quality printing machineries delivered in time at industry leading price-points. SAHIL Offset Printing Machine has been accepted by most of the reputed Printing houses, Govt. Departments etc. We cherish a healthy relation with Indian Govt. Printing houses including Indian Military Academy, Indian Navy, Indian Air force station, BSF Training Centre, Regimental Presses, Religious Societies like Golden Temple Press, Nathdwara Temple board Press & Educational Institutions like Kurukshetra University & Sardar Patel University, Gujarat etc. We don't just sell our products â�¦ but we offer comprehensive solutions to your business needs. At the time of Installation, we provide an exclusive practical training for your operator to make them well versed even with the safety, maintenance and proper working of the machine. SAHIL provides training on the various aspects of offset printing and machine control. SAHIL teaches the basics of non woven bag printing technology, non woven bag making guidance. We believe in educating offset printers in terms of technology and building self-confidence in printer for printing the finest jobs from our offset printing machines. SAHIL gives you training from skilled offset printers to printing technologists. SAHIL has trained all its customers and various offset printers in Faridabad, it is their feedback and feelings, which speaks about our technology and volume production. Today, all the customers who have bought our mini offset printing machines & Sheet fed offset printing machines are doing great business and have established their name in terms of high quality and high speed. Our customers have experimented various jobs on our SAHIL Carry bag offset, Non woven fabric printing machine, Mini Offset Printing machines & Sheet fed Offset Machines are producing excellent results. Whenever our marketing executives pay a visit to them the smile on their face says that they are satisfied with SAHIL Offset Machines. The overwhelming response and ever growing market demands of SAHIL Non Woven Bag printing machines compelled them to expand their production capacity drastically. Most of the customers have so far placed repeat orders for Sahil sheet fed offset printing machines to cater their typical need for offset printing wide range of stocks. To assure that the genuine printing machinery parts are easily and quickly available to our customers' door step, Sahil Graphics have started an exclusive showroom providing the original spare parts of our machine. This initiative offering effective as well as cost effective spare-part solutions, has been highly appreciated by our global clientele as it offers an assurance of the best performance of the machines, complete safety and increased efficiency. The â��SGâ�� model has today the complete range of Offset Printing Machine which includes Single Colour, Two Colour, Three Colour & Four Colour Non Woven Bag Printing machines catering to the requirements of big printers as well as small printers. Its products render unparallel performance to the utmost satisfaction of the client. We always believe in bringing new technology for our customers. This has helped it maintain its leadership position in the industry. We recently opened a class showroom of imported non-woven bag printing offset machines first time in India to display the live printing demo of our new range of non-woven bag printing offset machines. We always keep all non-woven D cut bag printing machines in ready stock of these including its spares. Our customer support team is always at the back and call of our customers and provides high quality service to our customers in an endeavour to minimize their machine down time.